First things first, cut all your string. Determine how long you want the length to be before, cut it and keep cutting the string. It takes a while. Put on a movie, binge watch a show. 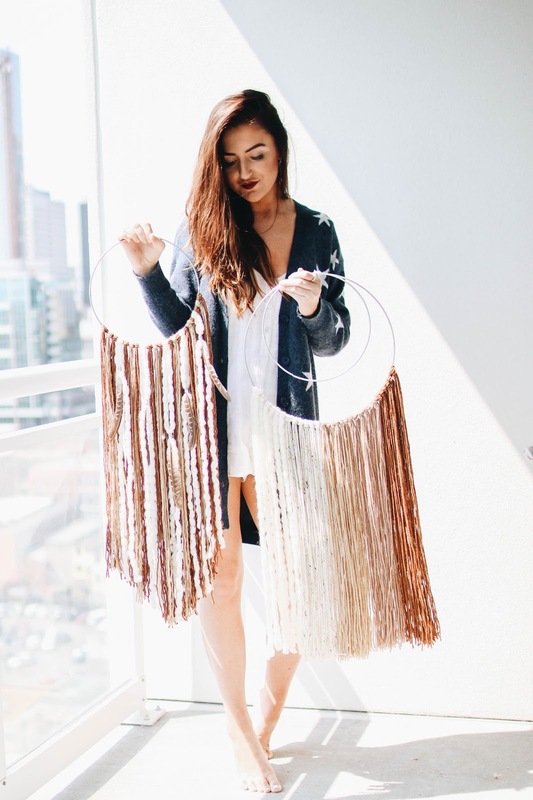 Do whatever you can till you have all your string cut up for the wall hanging. Better to have too much than too little. For reference, I used 5 strands of yard per bundle that I tied onto the circle loop. Loop the yarn onto the silver ring and pull it tight. You don't have to worry about the ends being the same length because you can always even it out at the end! 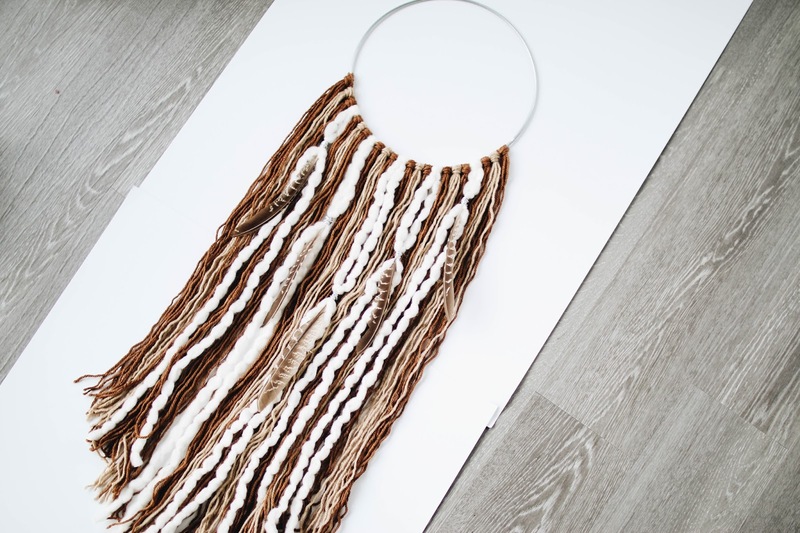 The best part about this is you can test out the arrangement of the yarns for your design of the wall hanging because they are easy to move around once you tie them up. Time to add the feathers! Just lay it out where you think you want the feathers to hit. 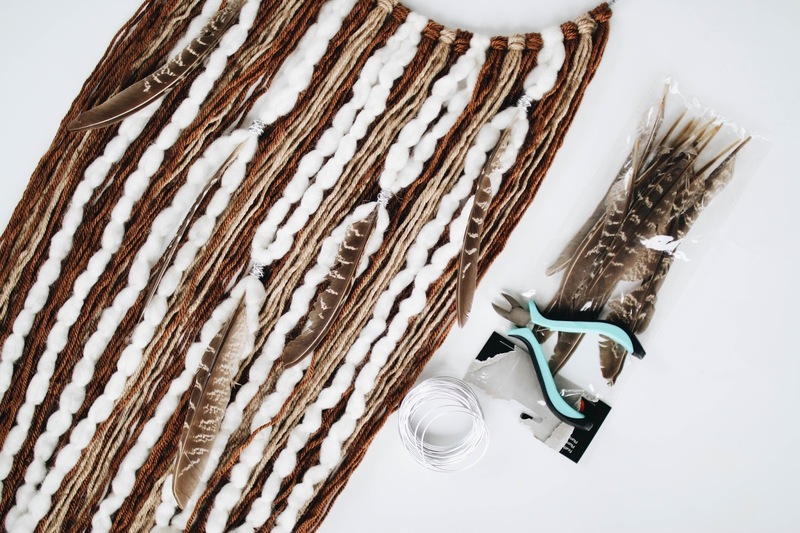 Taking the wire cutters, cut wire about 10 inches in length and wrap it around the tip of the feather onto the yarn. Super easy to do and keeps them super secure. It adds extra texture to the "art" by adding the metal and feathers. To cut the yarn once you're done hanging everything, hang the circle piece from something, I used my garment rack, and start cutting it. I started from the middle and made my way to the ends. I like it to look a little messy and not all one length so if it's not perfect, don't worry, unless of course, that's the look you're going for! So that's it! I love the end result and I hope you guys are excited to try this DIY out! Experiment with colors and textures and once you have your own wall hanging, tweet me pictures of end result. I love seeing you guys do my DIYs! Actually, I just love hearing from you guys in general. I hope you guys enjoyed todays post. What DIY would you like to see next? Leave it in the comments! omg i love it! you're killin the diy game. I love this! Definitely going to try this out as an affordable alternative to those beautiful wall hangings I've been seeing everywhere. your apartment is a total dream! My boyfriend and I just recently moved in together and I am decoration + combining gout styles. This is perfect! Thank you Sarah! LOVELY! I am looking for this DIY project.